With water levels at Magic Reservoir only at about 2.5 percent of capacity, the Idaho Department of Fish and Game is concerned about the health of the reservoir fishery. “We’re kind of keeping an eye on it, but it doesn’t look good,” said Doug Megargle, regional fisheries manager for the Idaho Department of Fish and Game. The reservoir level was at about 5,000 acre feet on Friday, well short of its capacity of 200,000 acre feet. The reservoir was at 16 percent of capacity at the end of May, but heavy use by the Big Wood Canal Company, which holds water rights for reservoir reserves, drained it down quickly. The Big Wood Canal Co. is also suffering from this year’s water shortage and was forced to end its irrigation season on June 28. Home to rainbow and brown trout, perch and bass, Magic Reservoir is a favorite fishing location in southern Idaho. Huge catches have been reported this year as lower water levels concentrated fish into smaller areas. 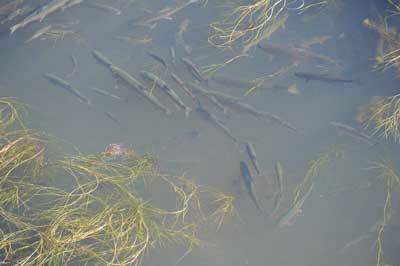 However, the water is so low now that fish may begin to die. Megargle said lower water levels will lead to warmer water, which results in lower oxygen levels. Under a salvage order, all catch limits are suspended and fishermen can use any method of catching fish except for firearms, explosives, chemicals or electrical shock. “The idea is that the fish are going to die anyway and there’s no reason not to harvest them,” Megargle said. Fish and Game is also keeping a watch on the three-mile stretch of the Big Wood River below Magic Reservoir and above the Richfield Canal diversion dam. The area is in a canyon and difficult to reach but is a favorite fishing spot for determined anglers. The water flow in the Big Wood River immediately below Magic Reservoir was at 821 cubic feet per second last Friday, as reported by the U.S. Geological Survey. By Saturday morning, after the Big Wood Canal Co. no longer had irrigation reserves, the flow at the same location was reported as 4.2 cfs. Megargle said that if conditions deteriorate in that portion of the Big Wood River, Fish and Game may have to issue a salvage order there also. With irrigation water at an end for the year, Fish and Game has already issued a fish salvage order for waters below the Richfield Canal headgate. The order became effective on Monday, July 1, and remains in effect until Nov. 1. The order suspends all bag, possession and size limits on the Big Wood River downstream of the Richfield Canal diversion. It also applies to the Richfield Canal downstream to the Gooding County line and to the Richfield Canal and Lincoln Canal systems. A valid Idaho fishing license is required to salvage fish.